While del.icio.us' search features might not be quite as user-friendly as we'd like, its ability to network classes and collect and purpose human attention makes it a powerful pedagogical (and scholarly) tool, providing a kind of tourist information center for the information superhighway. 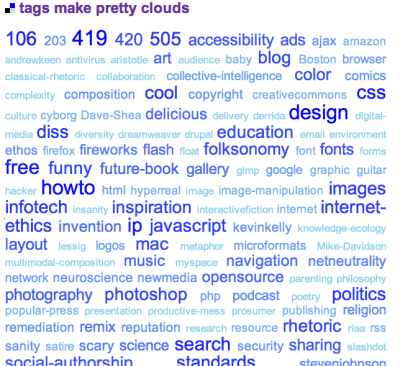 cloudalicious is a personal favorite, since, like Google Trends, it allows you to track the history of a web page. In this case, you can see how del.icio.us users have tagged a URL over time. similicio.us is a great search engine that uses del.icio.us tags to suggest websites similiar to the one you input. The author admits that the engine only currently works for fairly popular URLs, but as del.icio.us grows, the engine's usability should increase. del.icio.us Soup is a cool visualization software that allows you to see relationships between your tags. You've got to have a pretty good collection of tags before this one will have any "wow" factor. The internet is a big place. Please send anything I might have missed (or questions and comments) to insignificantwrangler at gmail dot com. Or just send me a link on del.icio.us. This webtext was constructed using Nvu (xhtml) and Gimp (png)— two open-source, free-ware softwares. It has been coded according to w3c standards for semantic xhtml 1.0 and css 2.1 and according to WCAG-Samurai standards for accessibility. Special thanks to Jenny Bay for turning me onto to del.icio.us and to Jeremy Tirrell for posting great links. Anderson, Chris. (2006) The Long Tail / Why the Future of Business is Selling Less of More. New York: Hyperion. Surowiecki, James. (2004) The Wisdom of Crowds . New York: Random House.